Spring is finally here in New York City. The birds are chirping. The trees are in bloom. My toenails are painted (and, more importantly, trimmed). And ramps have returned to the farmers market. I’ve previously reported on the ramp craze. While some might argue that we have reached the tipping point, after a long winter of turnips, potatoes and more turnips, the sight of anything green is cause for celebration. Plus, ramps are damn tasty. Blanch your asparagus in batches in a pot of boiling water. When the stalks are just tender but still al dente, plunge them into a large bowl of very cold ice water. (Do not skimp on the ice–even if it means that you will likely come up a bit short when it’s time to whip up a round of Sazeracs for the evening’s festivities.) Spread the asparagus on dish towels to dry. Then roll bunches in paper towels and stick in the refrigerator until just before serving. Boil the eggs. If you don’t have your own method, check out the technique I’ve been using since I was seven years old. It has yet to fail me. Now it’s time to prep the ramps. Rinse them thoroughly, giving them a soak if you see dirt in the folds, and trim the very tip. Bring the oil up to medium low heat in a cast iron skillet. Working in a couple of batches, place the ramps in the skillet so that the white parts are in the oil and the leaves are draped over the edge of the skillet. When one side has browned nicely, use the leaves as a handle to flip. When they’re nice and brown all over, shove them all the way in and allow the green portion to wilt and crisp up a bit. Sprinkle these with salt and set aside. Combine the rest of the ingredients and let chill for at least an hour. Just before serving, peel and roughly chop the eggs. Lay the asparagus onto a large serving platter and strew with the ramps. Spoon the remoulade over the top and then sprinkle on the chopped egg. This dish made for a lovely presentation as a first course at last night’s dinner party for eight people. While I failed to get a picture of the beautifully arranged platter, I did manage to capture a shot of the leftovers right before I devoured them with my fingers while taking a break from doing the dishes. 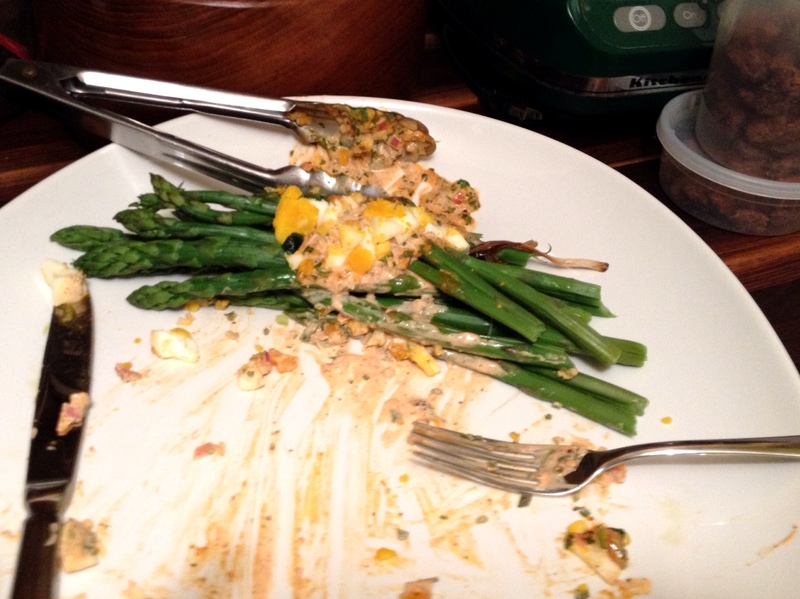 This entry was posted in appetizers & snacks, salads, vegetarian and tagged asparagus, eggs, ramps by Jasmine Nielsen. Bookmark the permalink.